American Mikah Meyer has an unusual goal. He wants to visit all of the more than 400 properties operated by the National Park Service. He spent January 2017 visiting historic areas in the southeastern United States. One of his first stops was Fort Sumter, a former military position in waters just off the coast of Charleston, South Carolina. Fort Sumter is famous for being the place where the first shot of the Civil War was fired. It is also where the first person killed in the conflict died. After years of rising tensions between Northern and Southern states, the two sides clashed in Charleston Harbor on April 12, 1861. That was when the Southern army launched an artillery attack on Fort Sumter. Federal troops surrendered the fort a short time later. Union forces eventually fought to regain control of the base, and defeated the South in 1865. 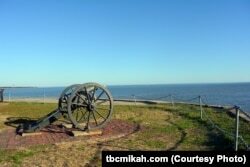 A lone cannon symbolizes the fierce battle that took place on April 12, 1861, when Confederate artillery opened fire on this federal fort in Charleston Harbor, South Carolina, marking it as the day the Civil War began. As he stood inside the large walls of Fort Sumter National Monument, Mikah Meyer looked across the water to the port at Charleston. He imagined what the area must have looked like more than a century and half ago. Meyer also visited the Charles Pinckney National Historic Site in South Carolina. There he had a chance to learn about Charles Pinckney, who helped write – and was a signer of -- the U.S. Constitution. 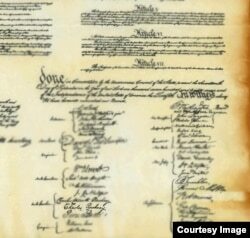 Charles Pinckney was 29 years old when he helped draft the United States Constitution, which he signed as a representative of South Carolina. He dedicated his considerable political and legal talents to the establishment of a strong national government. The National Park Service helps care for what remains of Pinckney’s former home and farm. Park service workers tell the stories of 18th- century plantation life for free and enslaved people. During his travels in January, Meyer had a surprise. Barack Obama, in his last few days as president, named a new national park site in Beaufort, just south of Charleston. It is called the Reconstruction Era National Monument. The Reconstruction Era National Monument will help tell the story of post-Civil war America. The Reconstruction Era stretched from 1861 to 1898. It was a period when Americans struggled with the treatment of newly freed African Americans. The new national monument will help tell that story. Driving south into the state of Georgia, Meyer stopped at Fort Pulaski National Monument. 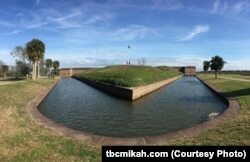 Many observers believe the creation of Fort Pulaski was a major turning point in U.S. military history. Built in 1861, the former base is considered one of the most modern posts of its time. It had a moat, with water that surrounded the whole fort. Just an hour’s drive south, Meyer visited Fort Frederica on St. Simons Island. He walked among the ruins of this former 18th-century settlement. 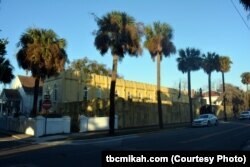 Continuing south, he visited the Timucuan Ecological and Historic Preserve in Jacksonville, Florida. He learned that a plentiful supply of oysters provided food for the Native Americans who once lived there. The Timucua Native Americans lived in northeast and north central Florida and southeast Georgia. 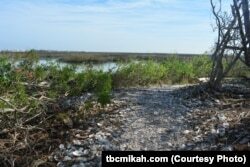 Meyer noted that some areas are covered with oyster shells. Former wetlands are now walkable because the remains of shells have turned into earth. Meyer explains how oyster shells are used as building materials. Continuing down the Florida coast, Meyer stopped at Castillo de San Marcos National Monument in the city of Saint Augustine. He also stopped at another former military post, the much smaller Fort Mantanzas. Meyer said visiting these historic places helped him recognize the many things the National Park Service does to protect national treasures for all to enjoy. Julie Taboh reported on this story for VOANews.com. George Grow adapted this story for Learning English. Ashley Thompson was the editor.